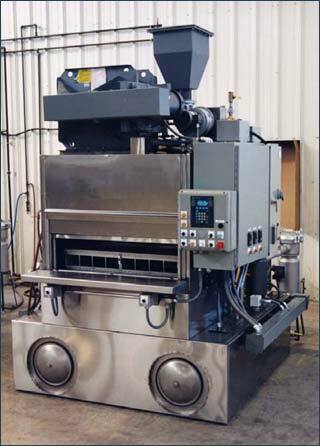 The Aqua-Kleen multi-stage rotating basket type degreasing machine is specifically designed for use with environmentally safe biodegradable aqueous or semi-aqueous cleaning solutions. The Machine effectively cleans, dechips, rinses, rust inhibits, and drys a wide variety of copper, brass, stainless steel, steel alloy, and plastic machined parts especially parts with intricate internal holes, cavities, and passages. The rotating fixture and domed type parts retaining lid is customized to handle the customer's partially filled mesh baskets. This minimizes material handling and prevents part mixing or loss during procedure. 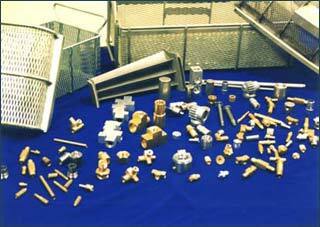 Special part fixturing, separators, and/or linings are available for processing delicate or critically machined parts. Thorough rinsing and controlled drying temperatures and times are provided to minimize or eliminate water spotting. An air operated automatic solution divert arrangement allows multi-stage processing in a compact cellular design. Continuous 360o rotation, during the process and dry cycles exposes all surfaces including cupped parts or parts with blind holes. Basket fixture automatically returns to proper load/unload position when automatic cycle is complete.